The 50- or 60-year-old female may have been foraging 10,000 years ago when she got mired in a swamp on what are now the Novosibirsk Islands off the coast of Siberia. Unable to free herself, her body quickly froze in temperatures of 14°F (-10°C). Her skin had been cut or torn, and her blood had dripped into a natural ice capsule. Her upper torso and legs were gnawed by predators, but the rest of her body – especially the lower jaw and tongue tissue – was-well preserved in the permafrost. Her flesh remained frozen without defrosting a single time over the hundreds of centuries. But incredibly the blood (IMAGE ABOVE), was liquefied like that of a saint. 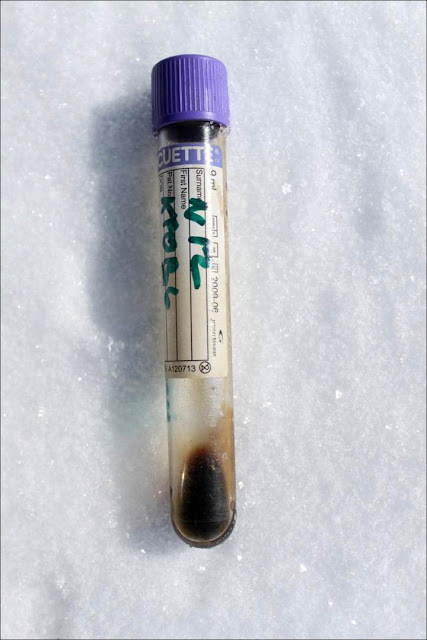 "We were really surprised to find...blood and muscle tissue,' says Semyon Grigoriev of the North Eastern Federal University. Grigoriev plans to study the blood of the mummy, which appears to have natural anti-freeze properties. Meanwhile South Korean bioengineer Hwang Woo-suk will attempt to extract DNA and, for the first time, clone an ancient woolly mammoth.